June 14, 2013, Victoria, BC (ISN) – Dylan Lavelle’s day started at 4:30 Thursday morning, boarding a ferry to Victoria. 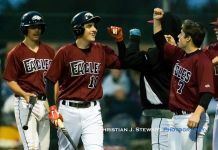 It ended over 18 hours later in the middle of a mob to celebrate his walk off double in a wild 12-11 victory over Medford. Lavelle’s 2-run double capped a 5-run ninth for the HarbourCats, who trailed 9-1 after 5 innings of play. Victoria put up 4 in the 6th and 2 in the 8th before finishing it off with the magical 9th in front of the remaining loyal fans at Royal Athletic Park. Victoria HarbourCats players line up for the singing of the national anthem during the PCL game between the Victoria HarbourCats and Medford Rogues at Royal Athletic Park – Photos by (David Bukach/ISN). Medford Rogues batter Quentin Urban checks his swing on a strike pitch during the PCL game between the Victoria HarbourCats and Medford Rogues at Royal Athletic Park – Photos by (David Bukach/ISN). The HarbourCats took an early 1-0 lead in the 1st, but Medford put up 3 spots in the 3rd, 4th and 5th innings to seemingly put the game out of reach. The HarbourCats bullpen, led by Logan Lombana and Ty Provencher, kept the HarbourCats in the game and within striking distance. Victoria HarbourCats catcher Alex Real blocks a low pitch during the PCL game between the Victoria HarbourCats and Medford Rogues at Royal Athletic Park – Photos by (David Bukach/ISN). Victoria HarbourCats catcher Alex Real waits for the relay to home plate while Medford Rogues runner Colin Sowers leaps into his slide during the PCL game between the Victoria HarbourCats and Medford Rogues at Royal Athletic Park – Photos by (David Bukach/ISN). After the 4-run 6th, Alex Real’s 1st home run of the season gave the HarbourCats hope in the 8th. However, down 4 with the bases loaded and 1 out, Austin Russell grounded into an inning-ending double play to thwart the rally. Victoria HarbourCats catcher Alex Real looks up as the umpire calls Medford Rogues runner Colin Sowers safe at home during the PCL game between the Victoria HarbourCats and Medford Rogues at Royal Athletic Park – Photos by (David Bukach/ISN). Victoria HarbourCats starting pitcher Joe Navilhon reflects on his effort after being relieved during the PCL game between the Victoria HarbourCats and Medford Rogues at Royal Athletic Park – Photos by (David Bukach/ISN). “That double play [in the 8th] was a huge buzzkill, but once I saw the first two guys walk [in the 9th], I said to myself ‘we have a chance here. As long as we don’t hit into another double play, we definitely have a shot,” said Real, who finished with 4 RBI on the evening. Medford Rogues coach Josh Hogan disputes a call at first base during the PCL game between the Victoria HarbourCats and Medford Rogues at Royal Athletic Park – Photos by (David Bukach/ISN). Medford Rogues pitcher Bo Cornish releases a pitch during the PCL game between the Victoria HarbourCats and Medford Rogues at Royal Athletic Park – Photos by (David Bukach/ISN). Victoria got 1 across on an RBI single by Real, but still trailed 11-8 when they found themselves down to their final out. Chris Lewis ripped a 2-run single into left field, taking advantage of how deep Medford left fielder Shakeel Newton was playing him. Lavelle would then step up and took a 1-2 pitch to the base of the wall in left-center to seal the magical comeback. Home plate umpire calls a strike during the PCL game between the Victoria HarbourCats and Medford Rogues at Royal Athletic Park – Photo by (David Bukach/ISN). A Victoria HarbourCats player warms up in the bull pen during the PCL game between the Victoria HarbourCats and Medford Rogues at Royal Athletic Park – Photos by (David Bukach/ISN). “We always feel like we can win the game, and we go into every inning going ‘we’ll win the inning’ and that’s what we did at the end,” said Lavelle. Victoria HarbourCats catcher Alex Real leaps in celebration as he comes in for the winning run in the ninth inning during the PCL game between the Victoria HarbourCats and Medford Rogues at Royal Athletic Park – Photos by (David Bukach/ISN). The Victoria Harbourcats team congratulates Dylan Lavelle after he drove in the winning runs in the bottom of the ninth during the PCL game between the Victoria HarbourCats and Medford Rogues at Royal Athletic Park – Photos by (David Bukach/ISN). The HarbourCats hit the road starting on Saturday, when they begin a 6-game road trip in Kelowna. First pitch from Elks Stadium comes at 6:35.